Do You Have Digestion Problems? 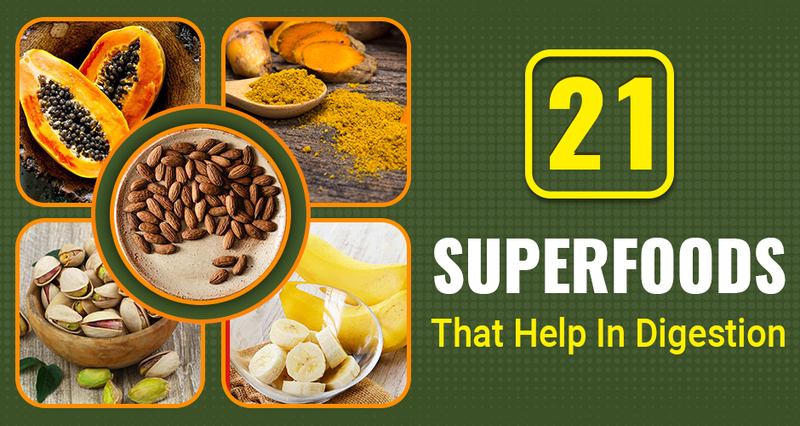 Try These 20 Superfoods! Whether you face digestive issues quite often or it is a comparatively rare occurrence, one thing you will surely agree on is that digestive problems can affect your overall health. Hippocrates once said, “All diseases begin in the gut” and he was not far off the mark. Research seems to suggest that 70% of the body’s immune system dwells in the digestive tract. Thus, a healthy and hearty digestive system is crucial to the body’s overall well-being. If you have digestion problems, you can try these 20 superfoods that help in digestion. Greek yogurt can be referred to as the cooler cousin of your regular yogurt. It is thicker and creamier and is rich in protein and probiotics. Foods that contain probiotics, like Greek yogurt can promote healthy gut flora to balance out the body. It fills the belly, improves digestion, and even strengthens the immune system. Blueberries are rich in fiber and are very good for the digestive system. They are actually superstars of the nutrition world as they are also rich in vitamin C and cancer-fighting compounds. Another rich source of fiber, kale is also a fantastic source of calcium and iron. It provides more antioxidants than most other fruits and veggies. Both onions and garlic are rich in probiotics and have been shown to boost immunity and well-being. Most of us Indians already include a lot of onions and garlic in our food, but we can also add them to salads and use them as seasoning too. Another wonderful root vegetable with a rich fiber content, beetroot should be the prime choice for those with digestive issues. The fiber helps to promote digestive and colon health by cleaning out the gastrointestinal system and ensuring regular, healthy bowel movements. Oatmeal is not only high in fiber but also has loads of antioxidants. This grain not only aids digestion but also has been shown to help in lowering cholesterol levels and improves metabolism. Broccoli makes for an ideal addition to your salads since this green vegetable is packed with vitamins, minerals, and a lot of fiber. Broccoli also has high levels of vitamin C and folate which can significantly reduce the risk of heart disease, certain cancers, and strokes as well. Turmeric is a well known Indian herb and can be found in all kitchen cabinets. This wonder herb has been used in both Chinese and Indian traditional medicine to treat digestive problems. Research suggests that it may be beneficial for treating dyspepsia, or indigestion and it is said to calm the digestive system and helps relieve gas and bloating. These nuts pack a lot of fiber and protein in their tiny structure. They are also naturally cholesterol-free and thus an ideal choice for most people. Another amazing option from the nut family are almonds. These are the most nutritionally dense nuts i.e. they offer the highest concentration of nutrients for every gram of weight. They provide all these nutrients at a very low-calorie value i.e by just consuming one ounce of almonds (191 calories) you can get 3.4 grams of fiber which is about 14 percent of the daily recommended value. Additionally, almonds also provide potassium, calcium, vitamin E, magnesium, and iron. They are high in protein and fiber and are low in cholesterol. Hence, beans can add a healthy twist to your vegetables, noodles, pastas and many other dishes. They are also loaded with folate and magnesium. Potassium intake helps in water retention and keeps digestion in check. It can also promote smooth bowel movements. Bananas are a rich source of potassium and can be a great snack or addition to your breakfast cereal. Leafy green vegetables such as spinach can help balance and smooth digestion. You can add spinach to your salads and smoothies or stir-fries to add a dose of nutrition and keep your digestive system healthy. Papaya has an enzyme called papain, which helps break down proteins and improves digestive health. It leads to a smoother digestion and eases the stomach after a meal. It also tastes great and can even be had as a dessert after your meals. Apples are a great source of fiber and boosts digestion. Apples are also associated with a reduced risk of cardiovascular disease, certain cancers, diabetes, and asthma. Black beans are an excellent source of protein and fiber. They help aid digestion and encourage regular bowel movements. They also provide fuel for healthy bacteria in the colon and helps in preventing constipation. Fennel or saunf not only adds flavor to food, but its fiber content also helps prevent constipation. Fennel also contains an antispasmodic agent i.e it relaxes the smooth muscles in the digestive tract. This action can reduce negative digestive symptoms like bloating, flatulence and cramping. These seeds are rich in fiber, which when ingested forms a gelatin-like substance in the stomach. It acts like a probiotic and supports the growth of healthy bacteria in the gut. Their fiber content also helps promote bowel regularity and healthy stools. Tulsi or Basil is rich in Vitamins A, D, E and K. It is great for reducing intestinal cramping and has antimicrobial properties and helps keep stomach infections at bay. It helps maintain healthy gut flora and is truly a superfood for digestion. Carrot is amongst the best foods that aid in digestion. Bountiful in nutrients including Vitamin A, B complex, C and potassium, iron, manganese etc it also supports healthy digestion and metabolism. It is anti-bacterial and aids constipation. It is also known to help stomach ulcers and reduces inflammation. It is high in calcium, potassium, vitamin C and pectin fiber. Lemon is known to support a healthy immune system and is also a great natural cleanser for the whole body. A glass of warm water and lemon juice helps in maintaining a good metabolism and also supports healthy bowel functions. These superfoods that help in digestion are rich in a wide variety of nutrients thus also are great for overall health. A rich and wholesome diet including these foods will surely keep your digestive system happy and healthy.